Propane appliances are energy-efficient and economical to run. In fact, homeowners who use propane appliances can often save money on their energy bills compared to electric appliances. We stock an extensive selection of propane appliances, including propane fire pits, gas logs, fireplaces, propane grills, propane heaters, cooktops, tankless water heaters and propane lighting. 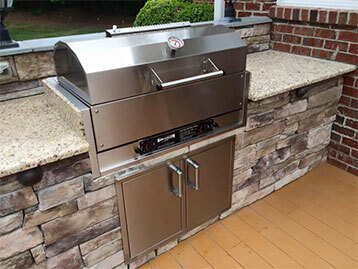 For outdoor living, propane is the fuel of choice for your backyard appliances. From fire pits to propane grills, outdoor lighting, and patio heaters for those chilly nights, propane powers them all. But propane isn’t just for the great outdoors, it’s also a clean-burning fuel that can power your indoor stove, too. Indoors or outdoors, cooking with propane is one of the best ways to go. You’ll be cooking like a pro and saving money too, as propane stoves heat up and cool down more quickly, distribute heat more efficiently, and are generally less expensive to run than electric. Our tankless, on-demand water heaters are propane-powered, providing you with a fast and fuel-efficient way to heat your household water. Cold water runs through the unit and is heated on its way to your faucets. Because there is no storage tank—unlike an electric storage water heater—it won’t lose energy from holding hot water at temperature until you need it. You will use less energy to heat water, you’ll have more space to use for storage, and when you need hot water, it will be ready to go in seconds. Propane is the most versatile fuel for all-around household use, powering propane dryers, lighting, and so much more. Staying warm and cozy in the wintertime is even better when you’re snuggled up to your gas fireplace or gas logs – and there’s never any wood to chop, ever! All major household appliances can be powered with propane, as can your household heating, hot water, standby emergency generators, and so much more. Please stop by our showroom to learn more about how propane can make a difference in your lifestyle. 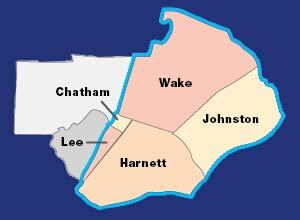 As a central North Carolina’s end-to-end propane supplier, K.B. 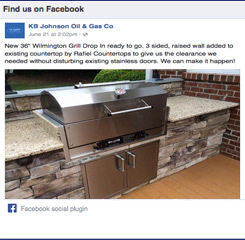 Johnson sells, installs, services, repairs, and fuels all your household propane appliances. Drop by our showroom to find out how much better everyday life can be with propane.